Unified Communications represents an entirely new paradigm for business communications and collaboration. 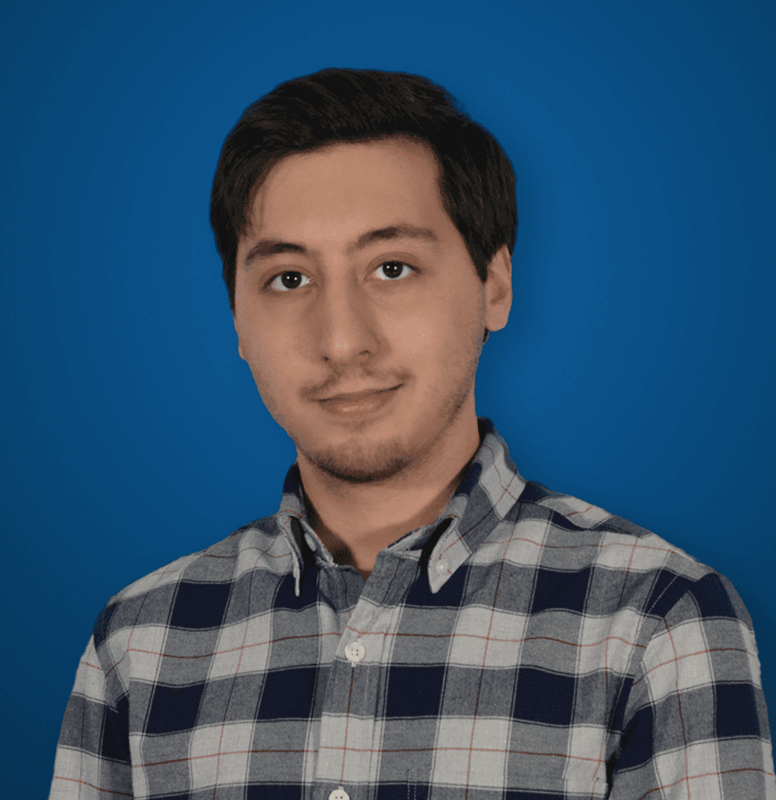 These applications combine a unique feature set of capabilities into a single integrated platform that enables us to connect with our team in entirely new ways, at a lightning fast pace. Chances are, if you are an IT manager, or even a single one-man band entrepreneur, you’ve at least heard of and come across Unified Communications at one point. However, with so many different definitions and examples of what a UC application is, even the most seasoned tech guru could have a hard time wrapping their head around exactly what these solutions are, what providers are worth paying attention to, what features are worth paying for, and what’s actually happening in the market. After all, the Unified Communications industry is one that moves at a rapid base, constantly introducing new features, solutions and paradigms. But, are users keeping up with the fast pace of UC providers? How can your business know if UC is worth investing in, or just another trend technology that will fade away shortly? Thankfully, that’s why we are here to help. 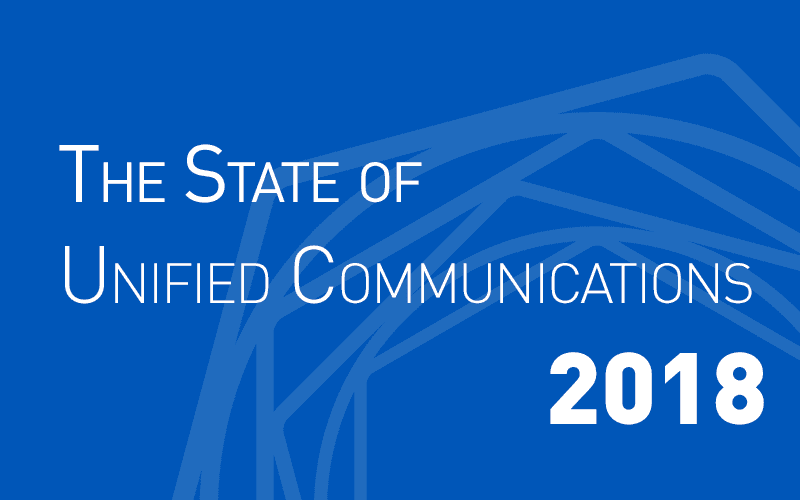 After scouring through numerous reports, blogs, business software websites, provider pages, and even our own blog, we’ve complied our own report determining the state of Unified Communications software in 2018. We wanted to take a close look at what UC is, where the market sits, and what end-user spending currently looks like now, and in the near future. We want to shine a light on the industry to help your business gain a better understanding of exactly what this technology is, and whether or not it’s worth investing in right now, or in a few years. A Definition: What is Unified Communications? So, we want to take an in-depth look into the current standings of the Unified Communications market, as well as a brief glimpse into the possible future of this massive industry. However, before we can start getting dirty and looking at the numbers and nitty gritty details, we need to take a step back and lay down the foundation for our discussion, a common groundwork to define what it is we are even discussing. To put that in English, Unified Communications is all about making it easier for us to communicate, collaborate, reach decisions, and get work done faster and more efficiently. The combination of these tools into a single platform enables users to connect with each other in real-time, through various methods. A text conversation might work for a quick question, but a video conference might be needed for an in-depth presentation — so all of these solutions are bundled together to create a power platform. Now, Gartner goes even further to define the industry beyond just a Unified Communications classification for solutions. Again, Unified Communications can be considered an umbrella term for solutions that enable users to, well, communicate in a multitude of different ways — all from one single application or platform. However, this doesn’t tell the full story. Unified Communications solutions can actually be delivered in two different methods. Traditional on premise solutions, according to Gartner, are classified simply as Unified Communications, meanwhile cloud delivered models are known as Unified Communications as a Service. This is an important distinction to recognize, as there is a bit of a difference between the two markets. Generally, according to Gartner, “many enterprise IT application leaders continue to purchase on-premises UC,” however, most will at least consider UCaaS during their evaluation process. 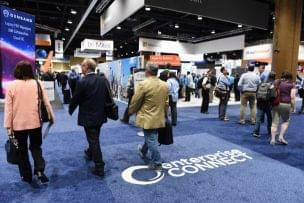 This is another interesting distinction to make, with large Enterprise organizations leaning towards UC, and smaller more agile organizations adopting UCaaS solutions. One of the major contributing factors to this simply comes down to cost. If your organization already has an existing IT environment, integrating a UC solution is much simpler — you already have the team to establish and maintain the solution. However, if your business is without an IT department, then UCaaS is deal as the “heavy lifting” is handled by the provider, all your users have to do is download and log into a client. Both of these delivery models still utilize the same cloud characteristics including shared data centers, and per-user-per-month pricing. However, more UCaaS implementations are beginning to leverage a multitenant architecture, “because it is easier to support, scale, manage and enhance with new capabilities and services.” While in contrast, managing each user’s individual software instance of a multi-instance solution can be much more time consuming. Even further, within their Market Guide for Midmarket Unified Communications as a Service in North America, Gartner wrote that “UCaaS solution adoption is [specifically] accelerating within the midmarket, with the adoption of services designed to improve collaboration, customer service, workflows and security.” The firm went on to estimate that the “North American UCaaS market for midsize enterprises was almost $1.5 billion in 2017.” As we can see in this chart for end-user spending, the trend will continue to reach roughly $2.8 billion by 2021. But now that we understand the distinction between UC and UCaaS, we can take a look at the entire industry as a whole — because beyond the delivery methods, these solutions are essentially the same: they both offer the same functionality and place a focus on real-time communications. Overall, when we discuss the adoption of Unified Communications, we’re talking about the decline for legacy telephony and conferencing solutions. And a question we might ask is, why is UC replacing legacy telephony and conferencing solutions? Again, according to Grand View Research, there is one major driving factor behind this technological shift: “companies are looking at ways to decrease costs, improve efficiency, and increase productivity.” We can even see the shift in spending from on premise to hosted solutions from Grand View’s Market Analysis. 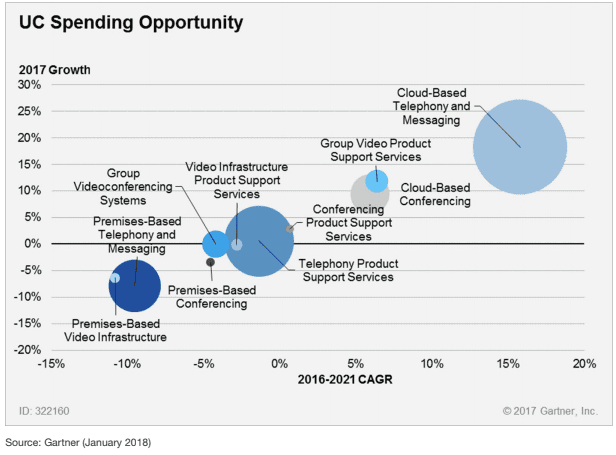 Going back to Gartner, their Forecast Analysis includes this chart of Unified Communications End-User Spending Growth Rates, clearing showing the increase in spending in UC and Cloud-Based Telephony, and a decrease in spending on premises-based telephony and messaging. It can be a little difficult trying to hone in on one exact reason as to why Unified Communications is taking off the way it is. It’s easy to say “UC makes our lives easier,” but that doesn’t necessarily do it justice. Businesses are always seeking for solutions that make their lives easier, so why is UC specifically such a critical new paradigm? After all, Gartner reports in their Unified Communications Worldwide 2017 Forecast Overview that “small-business cloud telephony adoption will nearly double from 2016 through 2021, to reach 45% of small businesses.” Well, for starters, cloud delivered solutions are much, much more accessible than costly on premise platforms. So, it seems as if a combination of accessibility — both delivery models and pricing structures — and demand for businesses to improve their operations in anyway is what’s fueling this massive paradigm shift across the market. Since we are seeing a shift from standard on premise UC to cloud delivered UCaaS solutions, we thought it important to take a look at the current UCaaS market. 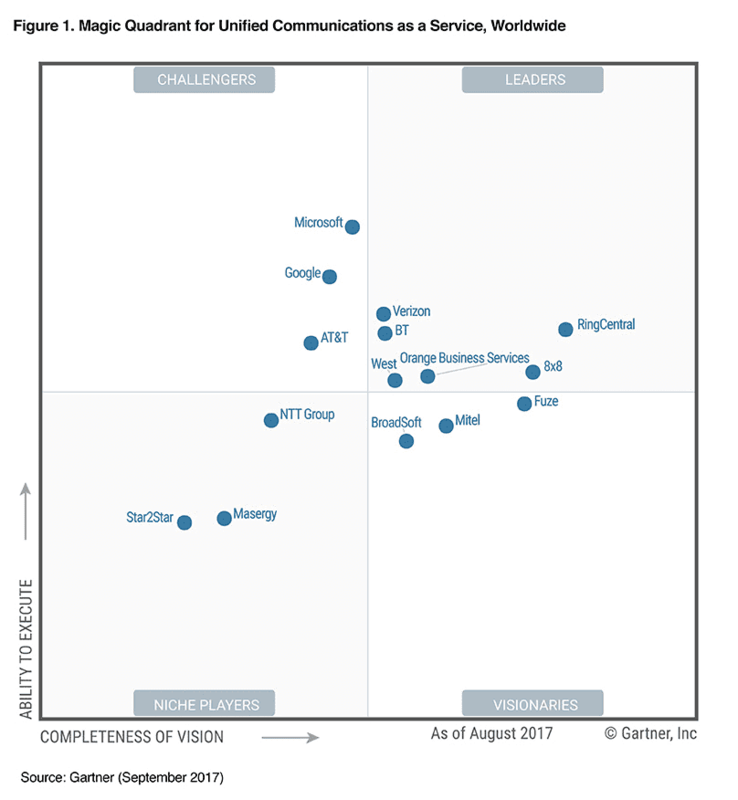 Gartner’s yearly Magic Quadrant is a wonderful source, highlighting the current market standings, and specifically including information on who is leading, and why. We generally tend to offer a rundown of these reports, and the information is worth including in our State of the Industry report as well. The last Magic Quadrant to come out was for last year, 2017. In this report, Gartner explained that providers are continuing to expand their service portfolios — there is a “fear of missing out” effect making its way across the industry. This is why we have seen a huge boom in Slack competitors, and collaboration platforms. As you can see, leaders consist of a mix of both cloud focused providers, and even legacy service providers like Verizon. We can also see some previous on premise UC focused providers, like Mitel and Microsoft, included on this list as well. Now, there have been some industry changes since this Quadrant was reported, so we expect 2018’s to look a bit different. For example, Mitel has announced they will be shifting to a cloud first model, and Cisco has acquired BroadSoft. But I want to take a look at the US based 2017 leaders to understand exactly why they are leading the industry. California based RingCentral has managed to hold onto their Leader position between 2016 and 2017, and offers a cloud focused platform generally to the SMB market. However, Gartner noted in 2017 that the provider had successfully begun expanding support for the midmarket and even enterprise accounts during the past four years. RingCentral offers a complete platform with a strong meetings experience, including Glip for collaboration. Based on their services, pricing and support, Gartner feels RingCentral is a strong option for SMBs and even midsize enterprises, up to 5,000 employees, that are searching for a mobile-first UCaaS provider. Many customers choose 8×8 specifically for “its integrated VCC CCaaS offering,” which includes features like automatic call distribution, outbound dialing, interactive voice response and chat. This is also offered within 8×8’s new “flexible contact center — ContactNow,” which was developed with smaller contact centers in mind. West was just recently acquired by Apollo Global Management, with the purchase completing in the fourth quarter of 2017. This acquisition has provided West with financial flexibility, enabling them to support long-term growth. West’s leading platform is actually based off of Cisco’s HCS stack, and offers robust UC functionality. Overall, West will be around for a long time following their sale to Apollo, transitioning the company into a private entity. The provider’s base of Cisco software also provides users with a proven and tested platform, and Gartner notes that West is one of the strongest choices for those specifically looking for a Cisco ecosystem. We all know Verizon as the legacy telephony provider, but they have also expanded into Unified Communications, specifically UCaaS even. In fact, they offer three different UCaaS offerings, which is actually also based on top of the Cisco HCS platform. Verizon generally targets the smaller end of the market, with businesses having around 250 to 1,000 seats. What’s unique about Verizon is their ability to offer a mobile first solution, with their One Talk platform. This can also integrate with traditional IP desk phones, which can lead to massive cost savings. Gartner specifically notes that Verizon pricing is competitive, with bundled services saving even more money. Overall, Gartner looks for what seems like a combination of cost effective, feature packed, well supported solutions. The analysis firm concluded that the UCaaS market is in a strong place currently, with increased global support, a strong feature sets, and a healthy list of options to choose from. Now, in this Magic Quadrant, Gartner did note that enterprise businesses currently lean towards on premise UC solutions, due to enhanced security, reliability and customization — but when shopping around, UCaaS is definitely a consideration for these organizations. However, in their Forecast Overview for Unified Communications in 2017, Gartner reported that “the rate organizations deploy cloud telephony will more than double from 2016 through 2021, from about 12% of users, to 28% of users.” They also noted in the Magic Quadrant report that “UCaaS providers are continuing to expand their capabilities to meet enterprise service requirements.” So, clearly there is going to be an upward trajectory for UCaaS. Unified Communications can be seen as a broad term for a new paradigm of business communication and collaboration. The combination of messaging, VoIP, video conferencing, file sharing and so on creates a uniquely powerful platform. These tools enable us to interact with each other in entirely new ways, and reach decisions at a lightning quick pace. We can confidently come to the conclusion that UCaaS is clearly here to stay, and will only continue to rise as the standard paradigm for business communications in the near future. Gartner predicts that there will be a steady increase in Unified Communications spending, and that the market is beginning to shift away from on-premise solutions to a cloud first mode. Clear evidence of this already occurring can be seen a number of existing market players: Mitel is shifting to a cloud first model, Avaya is focusing on delivering in the cloud, and even Cisco snatched up Broadsoft to bolster their cloud offerings as well.